The Natsumatsuri Family Festival will be presented as part of JANM Free Family Days on Saturday, Aug. 13, from 11 a.m. to 5 p.m. at the Japanese American National Museum, 100 N. Central Ave. in Little Tokyo. • Make a colorful suncatcher to hang in a window. • Create beautiful works of art by scratching your own designs into coated paper boards; as the black coating is scratched away, vivid rainbow colors are revealed. • Fold paper cranes for Harvest for Hope, a project that aims to collect 1.5 million cranes in memory of children who died during the Holocaust. This activity is inspired by Sadako Sasaki, a young girl who folded over 1,000 paper cranes in hopes of recovering from illness caused by the atomic bomb dropped on Hiroshima. One of Sadako’s original cranes is on display now in front of JANM’s Hirasaki National Resource Center. • It wouldn’t be Natsumatsuri without JANM’s signature paper hats. Make one that shows off your personal style. • Take home a souvenir photo of yourself in a traditional happi coat, courtesy of Nerdbot. Express line for JANM members. • Sample freshly made saataa andaagii — Okinawan deep-fried pastries — while supplies last. • While exploring JANM’s exhibitions, find all of the items on the scavenger hunt list and win a prize courtesy of Bandai. • Learn to fold a paper koi (carp) at Ruthie’s Origami Corner. • Bring your toddlers to the Toddler Room to relax and play with other toddlers. Note: all children must be supervised by an accompanying adult at all times. 11 a.m.–2 p.m. — Get a fun temporary henna tattoo by Beauty Marks Henna, made with all-natural ingredients. For children only; express line for members. Line will end at 1:30 p.m. Henna tattoos generally last one to three weeks. 11:30 a.m.–12 p.m. — Join JANM volunteer Hal Keimi for an energetic lesson in basic taiko drumming. 12:30–1:30 p.m. — Learn about Japan’s Obon festival, which honors and celebrates the spirits of ancestors, with Rimban William Briones of Los Angeles Hompa Hongwanji Buddhist Temple. A group bon odori (traditional dance) will then be led by Elaine Fukumoto. 1:30–2:30 p.m. — Prepare to be surprised and delighted by versatile magician Johnny Wu, who uses everyday objects to perform interactive magic tricks. Reserved seating for members. 2–5 p.m. — Impress your friends with a stylish temporary airbrush tattoo by TNT. For children only. Line will end at 4:30 p.m.; express line for members. Airbrush tattoos may last up to five days but can be removed with rubbing alcohol. 3–3:30 p.m. — Performance by L.A. Matsuri Taiko, which was founded in 1977 by Master Etsuo Hongo and is known for its powerful sounds, innovative techniques, and distinctive visual presentation. Reserved seating for members. 4–4:30 p.m. — Mellow out and take a break listening to electronic ballads by Common Souls. Reserved seating for members. 4:30–5 p.m. — Shin Kawasaki closes out the day with his own infectious mix of musical styles, encompassing technopop, prog rock, dub, acid jazz, fusion, metal, and drum-and-bass. Reserved seating for members. 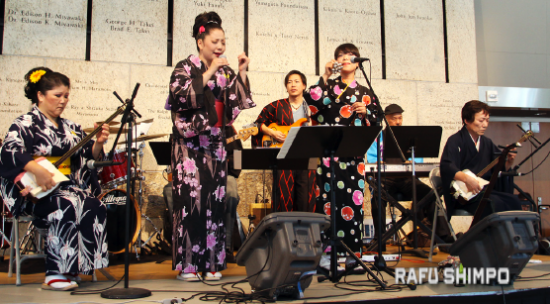 Note: This event coincides with the Nisei Week Japanese Festival and Tanabata Festival.